"Workplace stress" is the harmful physical and emotional responses that can happen when there is a conflict between job demands on the employee and the amount of control an employee has over meeting these demands. In general, the combination of high demands in a job and a low amount of control over the situation can lead to stress. Stress in the workplace can have many origins or come from one single event. It can impact on both employees and employers alike  According to,  three broad perspectives can be chosen when studying stress: (a) the response-based perspective, (b) the stimulus-based perspective, and (c) the cognitive transactional process perspective Occupational stress, hence, is found to be a mental and physical condition that calls in a detrimental effect on the individual's productivity, effectiveness, personal health and quality of work (Comish and Swindle, 1994). Main components of this work-stress process are potential sources of stress (stressors), factors of individual differences moderators/mediators) and consequences of stress. Stressors (job-related and extra-organizational) are objective events; stress is the subjective aspect. Thus the concept of stress can best be understood by saying that some environmental variables (stressors) when interpreted by the individual (cognitive interpretation) may lead to stress (Dua, 1994). Stress in the workplace can have many origins or come from one single event. It can impact on both employees and employers alike. As stated by the Canadian Mental Health Association: Fear of job redundancy, layoffs due to an uncertain economy, increased demands for overtime due to staff cutbacks act as negative stressors. Employees who start to feel the "pressure to perform" can get caught in a downward spiral of increasing effort to meet rising expectations with no increase in job satisfaction. The relentless requirement to work at optimum performance takes its toll in job dissatisfaction, employee turnover, reduced efficiency, illness and even death. According to Cartwright et al absenteeism, illness, alcoholism, "petty internal politics", bad or snap decisions, indifference and apathy, lack of motivation or creativity are all by-products of an over stressed workplace. Employees who start to feel the "pressure to perform" can get caught in a downward spiral of increasing effort to meet rising expectations with no increase in job satisfaction. The relentless requirement to work at optimum performance takes its toll in job dissatisfaction, employee turnover, reduced efficiency, illness and even death. Absenteeism, illness, alcoholism, "petty internal politics", bad or snap decisions, indifference and apathy, lack of motivation or creativity are all by-products of an over stressed workplace. NHS Health Scotland describes good mental health as a "basic component of positive health and well-being. It is necessary to help us manage our lives successfully, and provide us with the emotional and spiritual resilience to allow us to enjoy life and deal with distress and disappointment." Mental health can be a very positive thing. It is something that we all aim to have. However we all go through times in our lives where we may experience mental illness. 'Mental illness' is a shorthand term for a variety of illnesses that affect our mental well-being. It covers a range of symptoms and experiences. The present article is concerned with how the Information technology and the consequent change in job culture affect work stress, mental health IT professionals. This is particularly relevant because jobs in Information technology are the most coveted one in modern India, and the most brilliant section of the youth are going for it. Some indentified that the key factors at the workplace which generate stress among IT personnel in Singapore. It was suggested that factors which generate stress be grouped into 4 broad categories as Lack of career advancement related to the problem of high rate of employee turnover, Work overload resulting in spillover of workload at home and guilt and dissatisfaction for being less attentive to family, Risk taking and decision making consisting of fear of making mistakes and Employee morale and organizational culture related to a lack of participation in decisions affecting their work, undue blame for machine failure and difficulty in team work considering the fluid and noninvolved nature of work. In a study on Work Stress among Information Systems Professionals  it was found that employees reported the commonly experienced feelings such as frustration, pride in accomplishments, being overwhelmed, anxiety and common stress symptoms decrease in energy, anxiety, muscle tension, headache, stomach upset, negative thinking and insomnia thus both positive and negative effects were reported. It was discussed that employee's difficulties with stress within organization that continually introduce new technology and computer software into the work environment (http://faculty.lagcc.cuny.edu). Symptoms of stress are reviewed and employer and employee options to reduce stress are examined. The present study takes a holistic view of personhood and considers job stress as one imposed upon and interacting with other stressors. Therefore the study focuses on psychological distress, sense of wellness and organizational role stress of IT professionals as associated with stressful life events and coping resources. Very few studies have been obtained in this area. In India there is a virtual gap in study of this sector. Psychological distress in the present context has been defined as the overall feeling of anxiety, depression, and stress related somatization. It is the feeling of ill-being associated with various types and phases of mental illness. Wellness has been defined as a subjective feeling of being in a positive state of existence. Recent literature on mental health repeatedly emphasizes that absence of illness and presence of wellness are not synonymous: these have been found to be slightly and negatively correlated. Nadeem  investigated Among different occupational stress variables role over load, role authority, role conflict and lack of senior level support contribute more to the occupational stress. He concluded that Bank employees cannot afford the time to relax and "wind down" when they are faced with work variety, discrimination, favoritism, delegation and conflicting tasks. Starting from 1946 the World health Organization has consistently highlighted the significance of wellness in defining mental health. Subjective Well-Being (SWB) as a multidimensional construct involving factors like happiness, positive affect, social sensitivity etc. ,, numerated the three primary components of SWB: satisfaction, pleasant affect, and low levels of unpleasant affect, each of which can in turn be broken into subdivisions. Global satisfaction can bedivided into satisfaction with the various domains of life such as recreation, love, marriage, friendship, and so forth. Pleasant affect can be split into specific emotions such as joy, affection, and pride. Finally, unpleasant or unpleasant affect can be separated into specific emotions and moods such as shame, guilt, sadness, anger, and anxiety. Thus it is a measure of quality of life. Role stress refers to the conflict and tension due to the roles being enacted by a person at any given point of time. If Enacted in the context of organizations, such role stresses are called organizational role stress. Any organization may be perceived as a system of roles. These roles are different from positions or offices in the organization. Office is concerned with the hierarchical positions and privileges, whereas role refers to the obligations attached to that office. Thus, office defines the power of the holder. , Role determines the obligation of the person holding that office. Pestonjee and Pareek (1997) explains role as the totality of formal tasks, informal tasks and Distress, Wellness and OR acts as organized by an individual. Each individual is a member of social systems and the expectation as well as demand of one may put pressure on the other. There are 2 role systems: Role Space and Role Set. Both have built in potential for conflict and stress (Pareek, 2003). It may be expected that organizational role stress will operate in interaction with the general ill-being and well-being. There is unexpected high relationship of organizational role stress with these two. There is ample literature to associate life stress and coping resources to feeling of ill being and well-being. The stress diathesis model essentially says that the effect of stressors on illness and wellness is not absolute, but a function of moderating factors like inner strength and coping techniques. , One significant study by  asserted that three lines of research provide strong evidence that environmental adversity is important in the occurrence not only of post-traumatic stress disorder (PTSD) but also of other types of psychopathology, including major depression, alcoholism, substance use disorders, antisocial personality disorder and nonspecific distress. Dohrenwend developed a basic proposition that the likelihood of onset of the above types of disorder increases with two factors: (1) the proportion of the individual's usual activities in which uncontrollable negative changes take place following a major negative event; and (2) how central the uncontrollable changes are to the individual's important goals and values. (Robinson, 2000) studied how daily life events influence the affective and cognitive components of well-being. Results from cross-sectional and longitudinal studies of undergraduates showed that life events are closely related to mood states, mood states are closely related to cognitive wellness. And mood states appear to serve as the nexus through which changing life circumstances affect cognitive wellness. Though lot of studies on work stress and mental health were available in the literature but providing contradictory results. However, there are very limited number of studies if any in Indian context to understand the combination of variables affecting job level among managers. Therefore, the present study is planed to investigate whether job level will influence once occupational stress, job satisfaction, mental health and coping strategies of junior and senior managers of the IT industries. There will be a significant difference between junior level and senior level IT professionals with regard to their coping behavior. The present study was planned to investigate the influence of job level on occupational stress, mental health and coping behavior of IT professionals (managers) who have just joined into the organization and holding a junior level position and have less than 5 years of experience are called as juniors and the employees who have more than 5 years of experience i.e., up 10 yrs been considered as seniors. The sample consisted of 180 executives, attached various Information Techonology Industries spread over different locations of Uttar Pradesh (Luknow and Allahabad) state of India were selected randomly for the present study. The sample includes only males mamagers (junior and senior professionals) and functions includes systems, sales, marketing, and accountancy etc. The Head of Information Technology Industries were informed in advance that the name of the Industry will not be disclosed and the data will be used only for the purposes of academic research. The researchers have interviewed some of the junior as well as senior managers for collecting additional information relating to the present research. Then Questionnaires were distributed to sample of 250 executives at two levels i.e., junior working in different locations of the company. A total of 188 individuals responded the questionnaire of which only 180 were usable further, out of 180 there were 80 replies for the senior managers (professionals) and the rest were from the junior mangers. The physical and mental health of the Occupational Stress Indicator  was used to assess the health and well-being of the respondents. The Mental Health Scale consists of eighteen items of mental health symptoms, which were rated on a 6- point scale, some of which were reverse score. This scale has shown good validity correlation with sub-scale of Crown Crisp Experimental Index measuring free-floating anxiety, somatic anxiety and depression. The Physical Health Scale consisted of 12 items relating to somatic symptoms, which the respondents were asked to rate on a six point Scale from 1 (never) to 6 (frequently). For both scales, the lower score indicated greater well-being. The information on job level leaving full time employment was obtained on the questionnaire for inclusion in the analysis. Respondents provided the job profile and grade on the basis of which they were recognized as professionals for the purposes of the analysis. The [Table 1] shows the mean scores of job satisfaction level of the IT professionals (both junior and senior managers). The scores obtained by these two groups were not significantly different (t= 0.208, 1.65 and 0.72 respectively). On factors like job itself and organizational satisfaction, the mean values for the total scores are also not found to be significant. The [Table 2] shows the scores on mental health scale. It reveals that the two groups differed significantly on state of mind (t=2.26 significant at 0.01 level). but these two groups did not differ on resilience and confidence level (t= 1.26 and 1.66 not significant at 0.05 level respectively). The senior managers are experiencing better mental health than the junior managers (mean values 18.77 and 17.28) respectively. The results in [Table 3] shows the source of pressure in their job. The junior professionals were found to be different significantly in the experience of occupational stress (t= 2.50). Further the scores obtained by these two groups were analyzed factor wise and presented in the same table. The results show that the junior managers experiencing more workload, pressure on personal responsibilities and managerial role ('t' values are 2.18, 2.31, and 3.52 respectively). However, these two groups did not differ statistically on the following factors viz. Relationship with others, recognition in their job, organizational climate, home work balance and daily hassles. ('t'= 0.62, 1.64, 1.35, 0.69, and 0.95 not significant at 0.05 level respectively). The scores on coping stress was analyzed and presented in [Table 4]. The results reveal that the two groups are found to be significantly different on life/work balance. 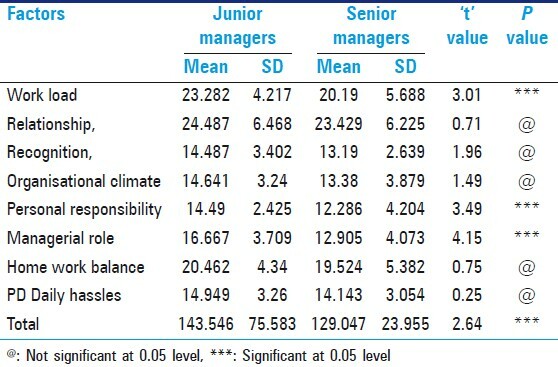 The mean values indicate that the junior managers are experiencing more work pressure due to life/work balanced than the senior managers (mean values- 16.1, 14.28 respectively). However these two groups did not differ on problem focus and social support. ('t' value- 0.79, 0.24 not significant at 0.05 level). Further the scores on Job satisfaction, Mental Health and Occupation stress and coping were obtained and analyzed by using product moment correlation method and the 'r' values were presented bellow [Table 5]. The result in the above indicates that Job satisfaction and mental health found are correlated but not significant. However, job satisfaction was positively and significantly correlated with coping behaviour. The mental health is negatively and significantly correlated with occupational stress. It can be explained that as job satisfaction and mental health increases coping behavior increases. And as stress increases mental health decreases. It has been observed from the above tables that the junior and senior mangers working in an information technology company experiencing similar level of occupational stress but they differ significantly, its sources and effects for comparable groups i.e., Job satisfaction or dissatisfaction was not a problem in this in this industries. It may be because the industries are taking care for satisfying both hygiene and motivating factors of the employees. The experience of occupational stress due to pressure from overload, personal responsibilities and managerial role, by the junior employees may be due to their position in the industry and have to work upto the expectation of their senior. It was well expected by the junior managers as they are to show their ability to reach higher position in the organization and consequently experience more work stress. This emphasizes the way in which the organization/ industry widening problems may bridge the junior managers and senior managers. 1. Aranðeloviæ M, Iliæ I. Stress In Workplace - Possible Prevention Facta Universitatis, Series: Med Biol 2006;13:139-44. 2. Hobfoll SE, Schwarzer R, Chon KK. Disentangling the stress labyrinth: Interpreting the meaning of the term stress as it is studied in health context. Anxiety Stress Coping 1998;11:181-212. 3. Lu L, Cooper CL, Kao SF, Zhou Y. Work stress, control beliefs and well-being in Greater China-An exploration of sub-cultural differences between the PRC and Taiwan. J Managerial Psychol 2003;18:479-510. 4. Cartwright K, Lewis D, Roberts C, Bint A, Nichols T, Warburton F. Workload and stress in consultant medical microbiologists and virologists: A questionnaire survey. J Clin Pathol 2002;55:200-5. 5. Strine TW, Ford ES, Balluz L, Chapman DP, Mokdad AH. Risk behaviours and health-related quality of life among adults with asthma-the role of mental health status. Chest 2004;126:1849-54. 6. Karasek R. Stress prevention through work reorganisation: A summary of 19 international case studies, in: Conditions of work digest; Preventing stress at work. Geneva ILO 1992;11:23-42. 7. Nadeem Malik. A study on occupational stress experienced by private and public banks employees in Quetta City. Vol. 5. Quetta: African Journal of Business Management; 2011. 20. p. 3063-70. Available from: http://www.academicjournals.org/AJBM. [Last accessed on 2011 Apr 18]. 8. Cohen S, Ewards JR. Personality characteristics as moderators of the relationship between stress and disorder. In: Newfield RJ, editor. Advances in the Investigation of Psychological stress. New York: Wiley; 1988. 9. Cooper CL, Sloan S, Williams S. Occupational Stress Indicator. Windsor: NFER-Nelson; 1988. 10. Dolan CA, White JW. Issues of consistency and efficiency in coping with daily stressors. J Res Pers 1988;22:395-407. 11. Fleischman JA. Personality characteristics and coping patterns. J Health Soc Behav 1984;25:229-44. 12. Hans Selye. The stress of life. New York: McGraw-Hill; 1936. 13. Homes, Mesuda M. Life Change and Illness Susceptibility - Stressful Life Events, their Nature and Effects. New York: Wiley; 1974. 14. Lazarus RS, DeLongis A, Folkman S, Gruen R. Stress and adaptational outcomes: The problem of confounded measures. Am Psychol 1985;40:770-9. 15. Folkman S, Lazarus RS. Manual for the Ways of coping Questionnaire. Palo Alto, CA: Consulting Psychologist Press; 1988. 16. Dohrenwend BP. The role of adversity and stress in psychopathology: Some evidence and its implications for theory and research. J Health Soc Behav 2000;41:1-19. 17. none Warr P, Cook J, Wall T. Scales for the measurement of some work attitudes and aspects of psychological well-being. J Occup Psychol 1979;52:129-48. 18. Robertson IR, Cooper CL, Williams J. The validity of the ccupational stress indicator. Vol. 4. United Kingdom: Work and Stress; 1990. p. 29-39. 19. Evans V, Ramsey J, Johnson D, Reece S, Chandler S. Analysis of the major stressors of K-12 teachers. Florida A M Univ Res J 1986;12:31-7.